Perhaps I picked a strange week to finally watch Amour, having just returned from a funeral, or perhaps I picked the perfect time. After all, I hear that it’s an emotionally wrecking movie, but the experiences in the movie seem brief and merciful compared to what a couple of my relatives recently went through. Emmanuelle Riva and Jean-Louis Trintignant are tasteful and educated, have lived together for decades in their quiet apartment where she gives piano lessons. One day she has a minor stroke, then a corrective operation doesn’t go well, and she slides further away every week while her husband watches, helping as much as he can, but desperately unable to keep her mind from deteriorating, until she’s almost completely gone and he finishes her off with a pillow. In a typically quizzical Haneke ending, their daughter Isabelle Huppert comes home at the end looking for them – we’ve seen police find the body in an opening flash-forward, but we don’t know where Jean-Louis has disappeared to. I thought it an excellent movie despite how dismissive I’m sounding here, and it’s encouraging that Haneke seems to have learned empathy. It’s also much, much better than the last movie I watched called Love. The movie (and Haneke and Riva) won all the awards, from césars and oscars to the Cannes palme d’or, but the AARP “movies for grownups” award went to Flight instead. The couple’s apartment, full of their memories and long collected items (paintings, books etc. ), slowly shifts from a haven to a prison, both physically (the camera rarely ventures outside the confines of their flat) and in the objects that fill the cavernous rooms. Music, once the loves of their lives, becomes a painful reminder of their pasts and what will never be again. 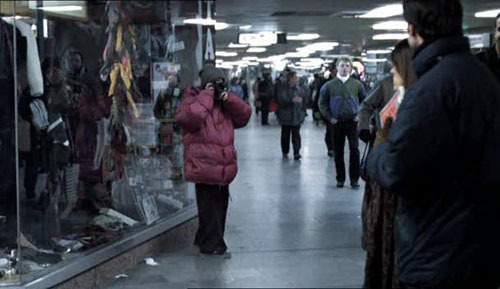 Haneke, in the use of long static shots allows the audience to soak in these all important details and help to understand who these people were before the debilitating illness systematically destroyed their world. Haneke, meanwhile, adhered demonstratively to the world of his polite, bourgeois couple, tactful even in the “provocations,” making Amour the ultimate in art-house art: a film that comfortably ushers its dwindling target audience towards its eventual demise. Troublesome movies because it’s the kind you’d want to watch a second time to fully study and understand BUT it’s got so many long shots of the family, their heads severed by the frame, eating breakfast, washing the car… then it gets so heavy at the end, not especially anxious to see it again soon. Family does boring stuff. One day, little girl at school pretends to be blind. Parents talk it over and even consult with the girl (not on camera). Write their parents a letter of explanation, which is the most dialogue in the whole movie. Cash in their car, empty their bank accounts. 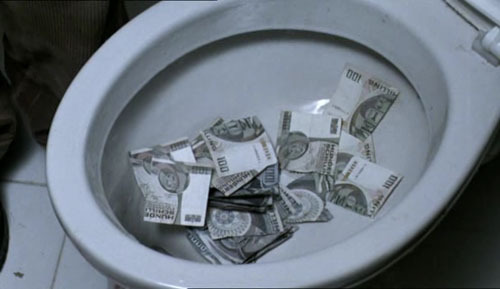 Flush all money down toilet. Destroy everything in the house. Kill themselves with pills. Overall good article at Kinoeye.org. I see his point that Haneke is, against all appearances, an optimist, and that this is an optimistic movie. I feel not only better about myself, but more determined after watching this movie. Mostly just “determined” to watch more movies, but hey it’s a start. “My films are the expression of a desire for a better world,” Haneke says. In the same interview, he says he regrets once having called this the “glaciation trilogy” because he wants it to be more complex and not so easily labeled. 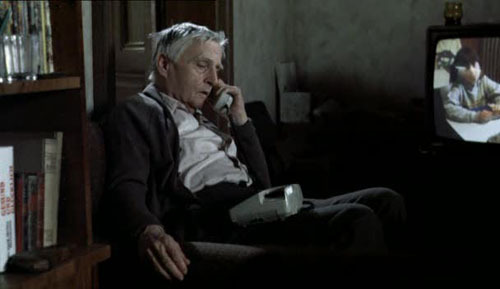 Old man living alone having trouble communicating with family. Student into ping pong and gambling. Runaway immigrant kid adopted by local family. News reports on global wars and celebrity scandal. A shooting at a bank. Punctuated by sudden silence and black between scenes. A clear predecessor to Code Unknown, but where I didn’t get C.U. at all, this one at least makes sense. Kind of your Amores Perros cross-sections of people united by an incident of violence, but of course far less obviously scripted. Not a causes-and-effects-of-violence sort of thing. The Haneke quote above makes perfect sense. He’s showing a bunch of familiar events, saying “what is wrong with this picture” and daring us to connect the dots. One of the most immediately easy to understand of his films, but still hard to watch. Well, I don’t know about that, “hard to watch”. With the long static shots and the lack of narrative structure, I think of them as hard to watch. But then, I compulvisely rent them, and I’d watch Time of the Wolf or Cache again right now or anytime. Not unenjoyable, but not exactly a magic-carpet-ride of entertainment. Need to come up with a new term to describe these. How do you recommend a Haneke movie to someone? Obviously I’m not alone, since the thursday afternoon show of Cache was sold-out in new york, and the video releases have been flying off the shelf here for a month now… he’s a popular guy. Benny spends a lot of time in his room, given money but not attention by his parents, watching rental movies, news reports and homemade movies of his sister’s pyramid-scheme and a family-vacation pig-slaughter. Eventually, inevitably, he invites another girl home and kills her with the pig gun. Parents find out and help Benny hide the evidence. And Benny turns them in! Says the three movies just out on video are a trilogy, “reports of the progression of the emotional glaciation of my country”. “My films are intended as polemical statements against the American ‘barrel down’ cinema and its dis-empowerment of the spectator. They are an appeal for a cinema of insistent questions instead of false (because too quick) answers, for clarifying distance in place of violating closeness, for provocation and dialogue instead of consumption and consensus.” Mattias Frey points out echoes of Benny in Wes Bentley’s American Beauty character, which I should’ve thought of myself.